Location: Dolna Banya town is situated in southwestern Bulgaria. 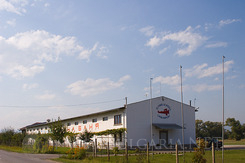 It is situated in the picturesque Dolnobanska valley, along the right bank of the Maritsa River. To the south it is surrounded by the northern slopes of the Rila Mountain and to the north it reaches the Septemvriiski hill (September Hill). Transport: Dolna banya town is situated right between Sofia and Plovdiv, south of the Sofia- Plovdiv- Svilengrad highway; which provides fast and comfortable transport. The town is just 8 km from the Kostenets railway station. The town has a comfortable access to Borovets mountain resort, as the Plopvdiv – Dupnitsa road passed through the town. The tourism route to the Rila Monastery also passes along the same road. Airport: The first private licensed airport in Bulgaria. It is situated in the valley of the Maritsa river, between Dolna Banya and Kostenets, in a region rich of mineral springs. The basic activities of the Flying Center are storage, maintenance and trade with VLA and most of all training pilots for VLA. History: Numerous tribes and nations have left traces in the region – Romans and Byzantium, Bulgarians and Slavs – all of them were attracted by the unique natural beauties – the warm mineral springs, the clean air and soft climate. 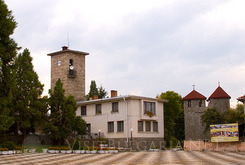 In the past Dolna Bansya was a crossroad settlement along the old road towards Plovdiv – Samokov – Nish and was an important stop for relax with its numerous inns. Little is known for the ancient history of Dolna Banya. The combination of the unique location, numerous mineral springs attracted people ever since ancient times. Climate: The climate is moderate. During the spring the nature is enlivened and the vicinities look like flourished ringlet and during the autumn of a shiny fleecy rug from the Rodope Mountain. The soft mountain climate, clear air and the warm mineral springs transform the town into an attractive resort. 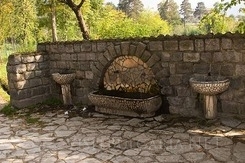 Mineral springs: The biggest wealth of Dolna Banya is the mineral springs. The thermal mineral waters of the town possess curative qualities. It is slightly mineralized. The geothermal spring has a debit 17 l/sec and has undiscovered potential. The temperature is 62 – 65 ̊̊ Celzius. The waters are suitable for treating and prophylactics of the locomotive system and posttraumatic conditions, respiratory system, gynecology and skin diseases and etc. Another mineral spring is situated in the site “The white water”, just 2,5 km in southwestern direction of the town. The water is 26 ̊ Celsius. The water is hypothermal and slightly mineralized. It is used for spa procedures and prophylactics. Tourism: The favorable physical geography conditions, together with the mineral springs in the region attract tourists all year round in the town. 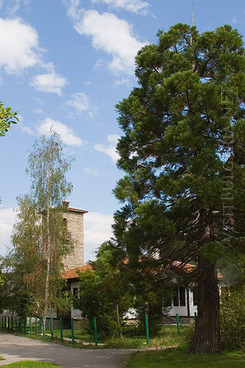 Several hotel complexes offer great conditions for relax among beautiful nature. The golf course situated nearby the town is favourite site for golfers from Sofia and the region. The comfortable transport connections, transform Gorna Banya into an attractive destinations for guests from Bulgaria and Europe. Every year Dolna Banya hosts the so called Eco festival, which is held in a clean natural region.